Carrie Underwood returned with a new music video Monday. The 35-year-old country star and former "American Idol" winner released an emotional video for her single "Cry Pretty" after breaking her wrist and injuring her face in a fall in November. 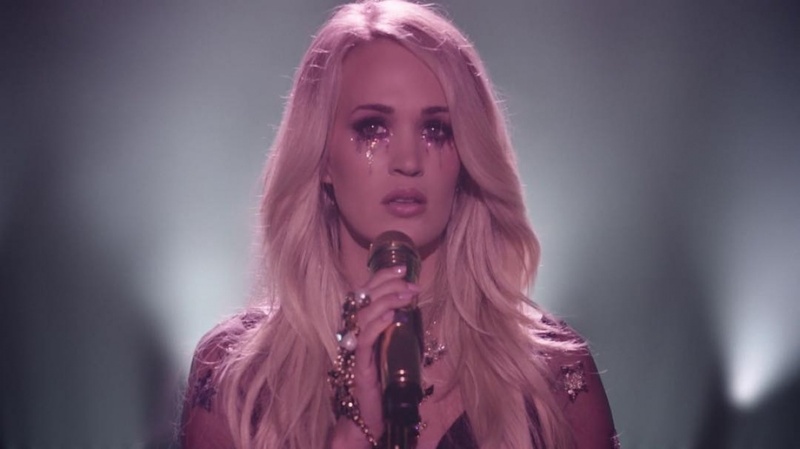 The video shows Underwood shedding tears on stage and breaking down after a performance. The tears are stylized with glitter in some scenes. "You can pretty lie and say it's okay / You can pretty smile and just walk away / Pretty much fake your way through anything / But you can't cry pretty," the star sings. Underwood said in January she required more than 40 stitches in her face after falling on the steps of her home. She shared a close-up selfie in April after giving fans an update on her recovery. "Physically, I'm doing pretty darn good these days," the singer said. "My wrist is almost back to normal, about 90% there... and the docs say that last 10% will come with time." "My face has been healing pretty nicely as well," she addd. "I definitely feel more like myself than I have in a while." "Cry Pretty" appears on Underwood's forthcoming album of the same name, which is slated for release in September. The country star last released the album Storyteller in October 2015.